Year 2 made a poster to give examples of apostrophes used for possession - what great teamwork! We have been continuing with our work on Andy Warhol by creating portraits of our favourite celebrities, as well as self portraits. 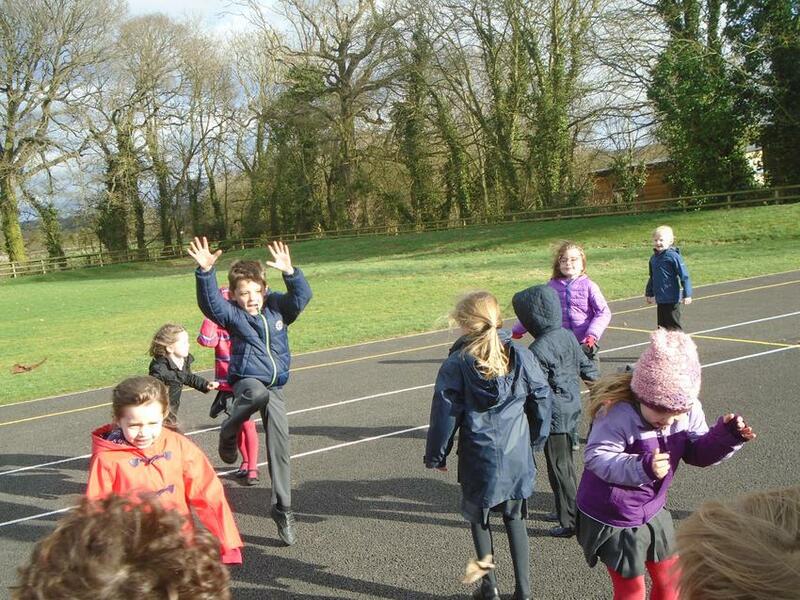 We were the first class to run a marathon distance at running club! Squirrel Class have been investigating different ways of testing the strength of magnets. We shared bread and 'wine' (black current squash!) during our RE lesson to help us to imagine how Jesus and his disciples may have felt during The Last Supper. We have been working towards our CREST Science awards in Forest Friday by being plant detectives. We found plants growing in unusual places around our school and tried to give explanations as to how they got there. What is the best position for your arms to go when you are running? Do older children line up Lego bricks faster? Which type of Lego brick is best for building a tower? Which chocolate melts the quickest? Do people with bigger feet kick footballs further? Squirrel Class received a letter from Mr Andrew Newton at The British Scientific Society. He wanted our help to find out all about forces and magnets through fun investigations which he can then use at his science fair. Of course, we were happy to help and got to work straight away! Wow! The RAF STEM Ambassadors visited our school today and what an amazing launch it was to our British Science Week celebrations. We took part in so many different activities to foster a love of STEM subjects. Activities included: making and launching rockets on the playground, programming robots and debugging algorithms, making really strong structures from only newspaper using force and design, and junk modelling race cars. There was so much opportunity for team work, discussion, creativity and problem solving. Squirrel Class loved sharing their favourite books as part of our World Book Day celebrations. We took part in a book swap, dressed up as our favourite characters, shared our favourite stories, made book marks and made our own books! Can you guess who we are? We have been learning about Andy Warhol and the pop art movement in our Art lessons. We had a go at creating some pictures using his 'blotted line' printing technique. The technique is very simple, however it takes a lot of little steps and patience. Our class reader this term is 'The Owl Who was Afraid of the Dark' by Jill Tomlinson. We will be writing fact files about Barn Owls like Plop. We asked questions about Barn Owls and then used the RSPB website to find out about the British Bird. We launched our new class reader in Literacy. Mrs McCleary gave us some mystery items and told us we had to include them in our story. We invented a story, sharing our ideas in groups, drawing story maps and writing small sections. We then presented our story ideas to the rest of the class. It was really fun and we came up with some very imaginative ideas! Our finished instructions: 'How to catch the Iron Man'. We worked with fire in Forest Friday! We started fires using flint and steels on cotton wool and then popped popcorn in the fire saucer. We know how to use fire safely and sensibly. We have been very busy learning about Venn diagrams in Maths. We sorted capital letters using our chosen criteria. We used mirrors to determine whether the letters had lines of symmetry and 'angle finder fish' to determine whether or not they had right angles! We have been learning more about 2D shapes in Maths this week. We have been completing lots of different challenges to practise describing properties of 2D shapes including sides, vertices and lines of symmetry. We have been working in pairs to make sequences in Gymnastics. We loved performing for our friends. 'How to catch The Iron Man'. We have been using our class reader to write instructions this week. We have been working together to learn how to keep safe on the internet. We learned about digital footprints, reliable information, and what to do if we get that 'Uh Oh' feeling. We have been continuing with our Shadow Puppet Theatres in Science this week. We used our knoweldge of materials to select the best translucent material to use as a screen for our theatre. We also experimented with moving the light, colour mixing and sound effects to enhance our story telling. We made a Christingle to take to our Candlemas service in Church. This is one of our favourite traditions in the Spring term. We have been using our knowledge of light and shadow to continue with our shadow puppet theatre project. We chose to make our puppets from black card because it made the clearest shadow. Squirrel Class had an amazing trip to The Look Out Discovery Centre in Bracknell this week. We had the opportunity explore and problem solve through play based exhibits. In the morning we participated in a show about light, where we learned about colour mixing, UV light, shadows, light beams and how sun cream works to keep us safe. Our day finished perfectly with a walk back to school the fresh snow flurries! What a lovely day! We have been thinking about being quiet, calm and peaceful to help us with our thoughts and feelings. We loved spending time in our favourite outdoor, peaceful spaces during Forest Friday and writing prayers to help us to reflect and be thankful. In Science we have been learning about reflection. We had some challenges to complete using mirrors. Our PSHE topic this term is 'Who am I?' We are learning what makes us special and how to love ourselves, our similarities and our differences through our developing sense of self. Have a look at our self-portraits! Mrs McCleary got the 'dark den' out so we could test which materials show up better in the dark. We have also been continuing to make our shadow puppet theatres. Come rain or shine we love using our outdoor environment to inspire our learning. We went on a 'simile hunt' to help with our creative writing. We found tree bark 'as bumpy as bubble wrap' and the rain was 'as gentle as a cobweb'. Awe and wonder in Science! 'I wonder....' all about Light! Squirrel class had some interesting ideas! We have been using story maps and story stepping to help us to retell The Iron Man. We have loved starting our new class reader this week 'The Iron Man' by Ted Hughes. Mrs McCleary read the first chapter and we described the Iron Man using expanded noun phrases. We also took part in some role play, imagining how the broken pieces of the Iron Man would move across the beach to find their way back together. We have been working hard to understand division with remainders this week. 'BRIGHT SPARKS' We loved launching our topic this week with lots of different activities to explore light. We looked at how the light helps us to see more clearly and spotted different colours of the light spectrum by blowing bubbles! We will also be making 'light whizzers' and shadow puppets so keep an eye out for those! In our RE lessons this term we are learning to retell bible stories where miracles might have happened. We have been questioning whether Jesus really did perform miracles. Our key questions this term are: Could Jesus really heal people? Were these miracles or is there some other explanation? Christmas craft week! One of our favourite ways to spread Christmas love and kindness is to make cards and gifts for our family, friends and neighbours. Squirrel Class have shared 'A Christmas Truce' this week, a beautiful story of finding love and peace at Christmas even in times of conflict. Inspiring young scientists...We had an amazing visit from Science Oxford. We learnt about the Science behind rockets and space travel before designing and making our own rockets to launch on the school field! What an amazing world we live in. We developed our 'working scientifically' skills by making predictions, observing what happened and evaluating our rockets. Everyone got involved and loved it! Loving what we found today..We made some Christmas stars out of willow to decorate our classroom. Squirrel Class have been sharing God's love by participating in a traditional Possada celebration. The children have been taking turns to give Mary, Joseph and Donkey a home for the night before bringing back to school. We have been sharing a special Possada blessing in class each day. Loving God's world..We made 'wind catchers' today in Forest Friday. Squirrel Class have been considering what our Core Values mean to us and what they look like around school and at home. The children came up with some really thoughtful ideas and can use our display to say where they have seen our Core Values being shown each week. We really enjoyed taking part in 'RE Inspired'. We retold the Nativity story, made Christmas cards and sang some Christmas hymns. We used this time to think about the true meaning of Christmas. We have been taking our first read throughs of our Christmas Play very seriously! Helping and supporting each other to learn their lines. Loving Maths! We made a Squirrel number line! Squirrel Class have been busy measuring in Maths. We investigated the question 'Are both of our feet the same size?' Of course not because we are all special and unique..Year 3 also conducted their own measurement investigation and presented their findings in a bar chart. We 'magpied' descriptive vocabulary from our class reader 'Stig of the Dump' and shared ideas for our writing. We also helped Mrs McCleary to edit and improve her writing! Showing the love for others today..We dressed up in spotty/Pudsey mufti and had a ramble around the village to raise money for Children In Need. We have thought really hard about how we can 'Choose Respect' as the theme for Anti-bullying week. We talked a lot about small things we can do every day to show respect, such as not interrupting people, greeting people with a smile and asking to borrow things before you take them. Children in Squirrel Class participated in role plays to explore how to stand up to bullying, made promises to choose respect and iced biscuits for each other as an 'act of kindness and love'. We have been studying poems by Benjamin Zephaniah in Literacy. We came up with some top tips for reading poetry aloud and then had a go at learning one of his poems. We have been working so hard to understand fractions in Maths. We have been collecting, exploring and comparing soil samples as part of our Science work. We have been using the internet and non-fiction texts to research Star Carr archaeological site. Some of us even made red deer antler headdresses like the ones found at the site! What an AMAZING day we had with Paul Sturgess, Harlem Globetrotter, 'World's tallest professional basketball player' 2011 and currently Britain's tallest man. We learned lots of new basketball skills and improved on these throughout the day. Paul also taught us the importance of having a growth mindset, being dedicated, working hard, looking after our bodies and being proud of who we are. Check out our tricks and skills! Talk for writing! We have been sharing our ideas for Big Write this week, specifically describing characters from 'Stig of the Dump'. In Forest Friday Mrs McCleary challenged us to form a band using only natural things for instruments. We used stones, the floor, sticks, logs and our voices! During our Maths lessons this week, we used the BeeBots to help with our learning on position and direction. 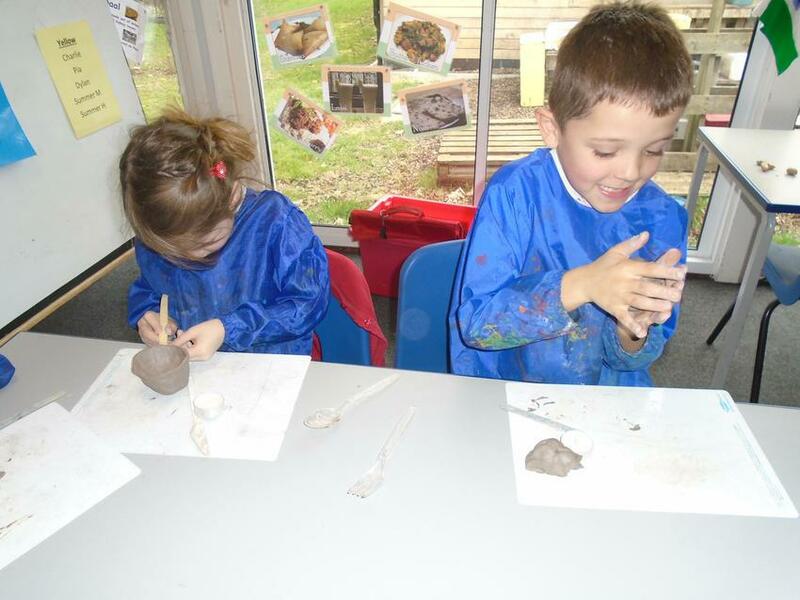 We have been making clay Diva lamps and Rama and Sita puppets as part of our RE learning about Diwali. We loved performing the puppet show of the Diwali story for our friends in Squirrel Class! We have been learning about writing as a process this week to help us plan, write, edit, improve and redraft our extended writing. 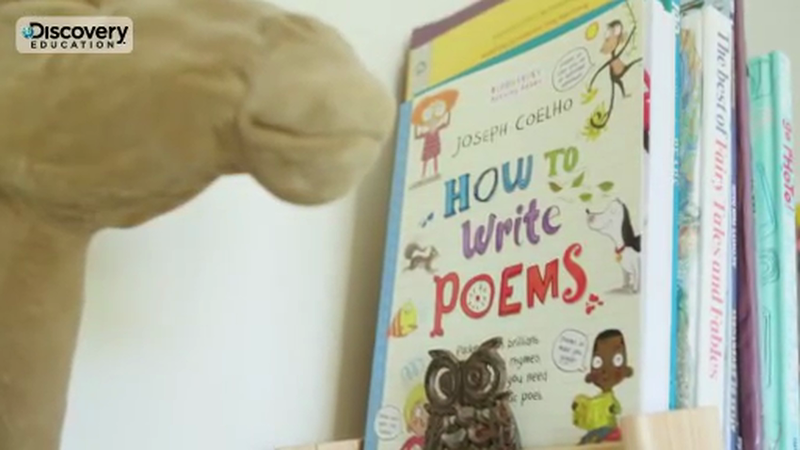 We watched this video of Joseph Coelho talking about his writing process for writing poetry to borrow some ideas. Squirrel class had a visit from Sue the geologist. She helped us learn more about our rocks, fossils and soils topic. She bought in lots of interesting things for us to explore and answer our questions. She even gave us our own fossilised shell to take home, how very kind. We have been learning traditional Diwali celebrations in RE. Year 2 had a go at designing their own Rangoli patterns, using bright colours and straight lines. Some of us used symmetry in our patterns too. Squirrel Class have been playing a version of Tiddlywinks to practise mental addition of small numbers. We talked about using number facts, number bonds, doubles and rearranging the number sentence as strategies to add quickly in our heads. We have been learning to play chess. 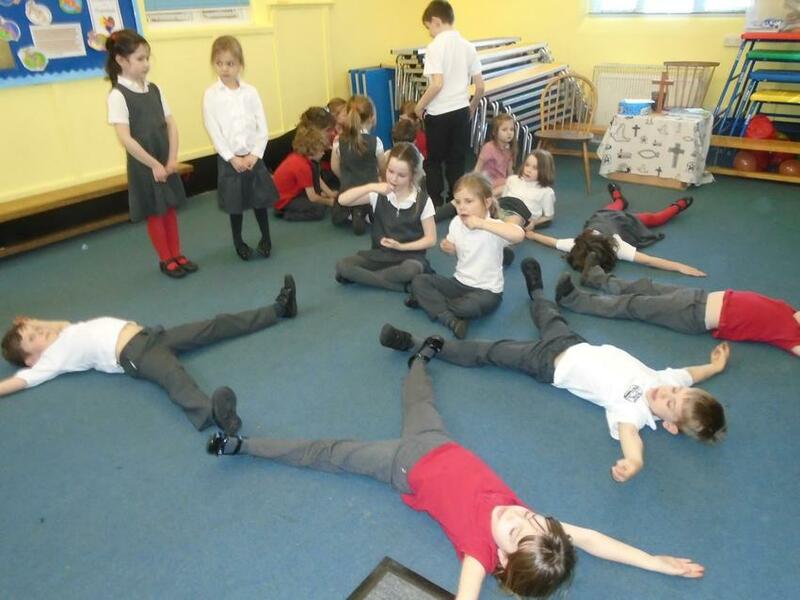 Fox and Owl class came to show us their role plays of the Benin creation story as part of their topic work - they were really dramatic! We are studying 'Rocks, Soils and Fossils' in Science this term. We have been on a rock hunt around school and sorted them by their characteristics. We had such a wonderful trip to Hill End to learn all about life in the Stone Age. The children enjoyed a truly hands on experience and took part in many activities including: Stone Age shelter building in tribes, experiencing a Stone Age round house, foraging for berries, grinding wheat, cooking bread over a fire, making spears and more! 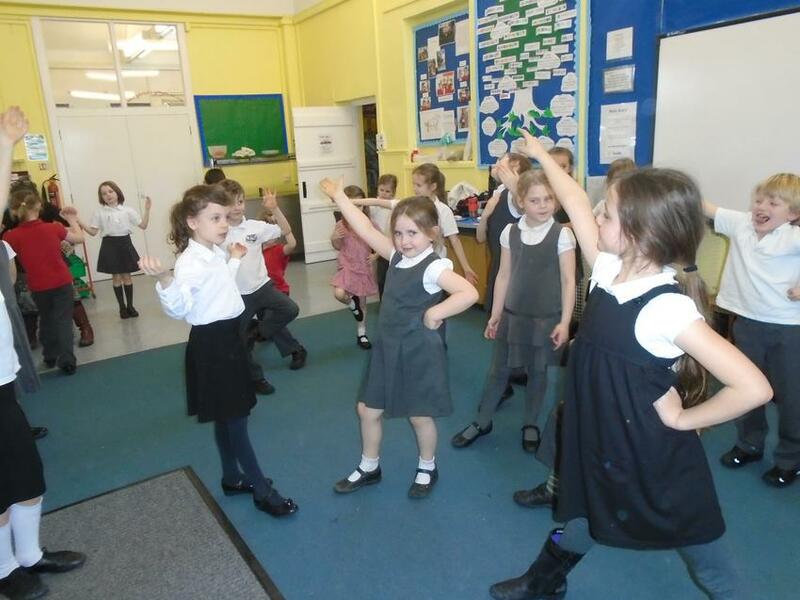 We have been enjoying our class story 'Stone Age Boy' and using drama to retell the story. We have been innovating our own versions using role play too to help with our writing. We have been busy revisiting place value in Year 2! 10 Questions to Develop a Growth Mindset in Children. What did you do today that made you think hard? What happened today that made you keep going? What can you learn form this? What strategy are you going to try now? What will you do to challenge yourself today? What will you do to improve your work? What will you do to improve your talent? What will you do to solve this problem? Welcome back to Squirrel Class! We have been busy launching our Awesome Archaeology topic this week. We found out that archaeologists dig for clues to tell us about the past. We have been imaging all the things we might excavate on our school field. A piece of plate, bones, fossilised dinosaur poo and more! Stone Age Day! We went back in time to imagine what it might be like to live in the Stone Age. We made paint by mashing blackberries from the field, made clay pots to eat and drink from and turned our classroom into a cave. We have some really interesting things on our Science table. Mrs McCleary even turned some celery blue! Books for topics. Have a look at these websites! Crazy hair day fundraiser for our school fete! We have been blending water colours to match the colours of the plants around school in our art lesson. Squirrel Class really enjoyed their visit from an American West group. We learned about the food, music and culture of Native American Indians, tried on some traditional clothes and played a traditional game. The group told some wonderful stories, showed us a dance and taught us songs and sign language too! We have been making mini-greenhouses in our DT lessons. They are now soaking up the sunshine helping our cress to grow. We have been really busy weighing, measuring and making graphs in Maths this week. Outdoor learning is our favourite! 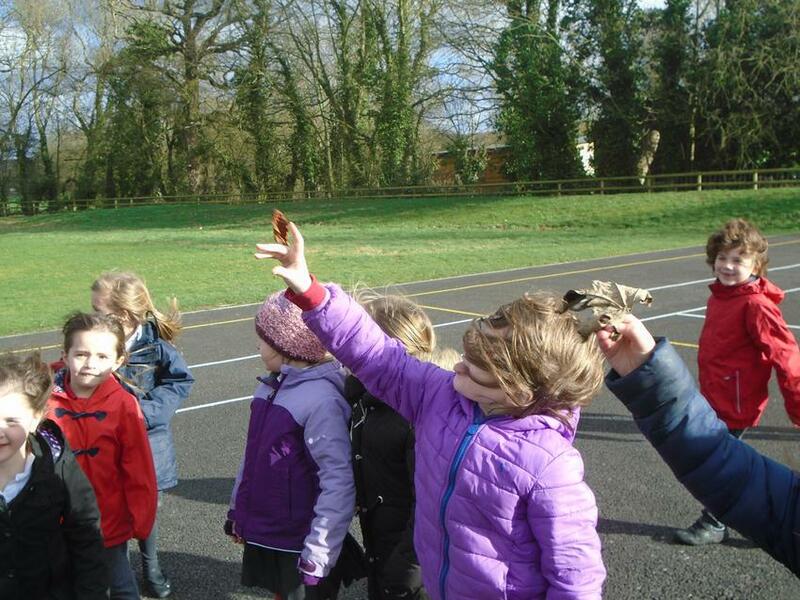 We really enjoyed working with Hedgehog Class to have an Outdoor Classroom Day. We did Big Art on the field, reading outside, capacity activities, drawing with chalk, team games and much more! We have been working with Hedgehog class to produce some sketches in the style of William Morris. We have been dissecting flowers in Science this week to help us identify the different parts and what they do. In DT we will be making mini greenhouses. We have been exploring how to make a strong and stable structure. We have been developing our cricket skills in PE this week. We have been bringing in our favourite poems from home to share with our friends. We have been looking at the 'All the Wild Wonders' poetry anthology in Literacy. We used the 'wild wonders' on our field and sensory garden to get inspiration for our own poetry. The results of our cress investigation! None of the seeds really germinated or grew. We concluded that seeds need light, water and heat to grow. During RE enrichment week we made posters about the Jewish Faith with Year 6 Buddies. We also made our own Mezuzahs and wrote a special prayer to go inside. 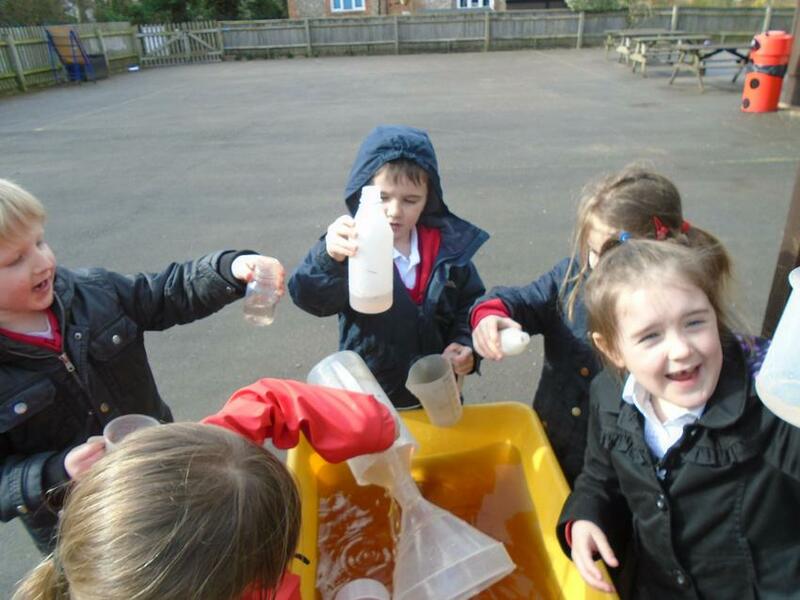 We love playing in the Mud Kitchen! We have been orienteering during Forest Friday! We have been celebrating the Royal Wedding by dressing as wedding guests, enjoying a Royal school lunch and designing our own commemorative mugs! We have been super busy in Maths this week making our own 3D shapes and describing their properties. We also made clocks outside to help us practise telling the time! We had an amazing trip to The Harcourt Arboretum. We learned so much about different trees, plants and flowers and got to spend time sketching in the bluebell wood. The peacocks were friendly...some even tried to join us for lunch! Sharing our story maps before Big Write. We have been sorting 3D shapes using Venn and Carroll diagrams. We have been working together on different money challenges in Maths. We use our 'Writer's Cafe' display to help with ideas for our writing. This week's specials are words to use instead of 'said'. Our new story is The Flat Rabbit. We have been using role play to understand parts of the story. Look at our designs for seeds that stick! In our RE lessons we have been thinking about the kinds of promises we make to each other and to God. We are learning about the special relationship Jewish people have with God this term. We have been enjoying the sunshine by creating art work with our shadows. In Science club this week we explored and played with our shadows. How wonderful! We have been using role play to generate ideas for our writing. We have been making obstacle courses to challenge ourselves in PE. Playing money board games in Maths this week. In Art enrichment week, we used collage to create our own Lowry pictures. Do people with the longest arms balance for the longest time? Do people with longer legs jumps further? Does more water travel further? Does a run up help you throw further? Tiny Art! 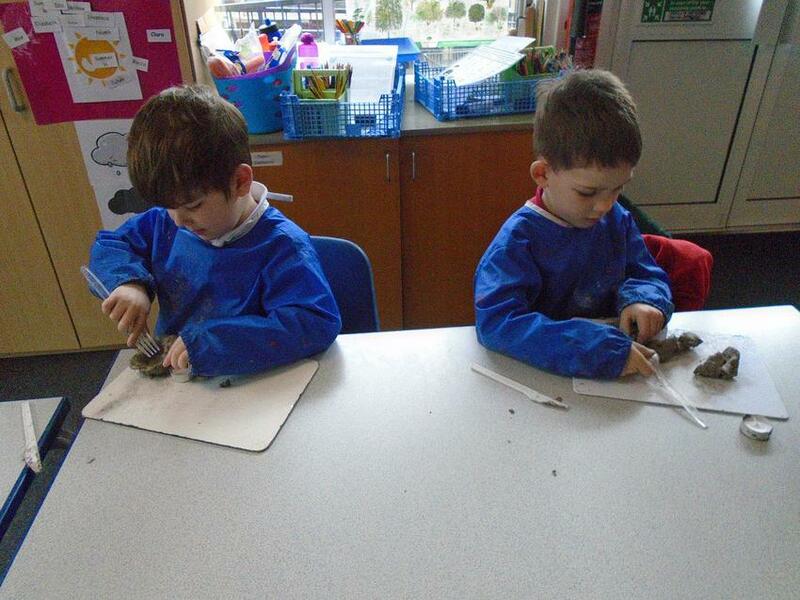 During our Forest Friday activities, we had to look really carefully for tiny natural objects to use in our art work. Sharing our ideas to write a class riddle. We celebrated World Book Day this week. Can you guess which characters we are? Finding change in Maths this week! We have been digging over our raised beds to plant seed potatoes. We have also been making colour swatches of all the wonderful signs of Spring. Working together to learn our times tables by drawing arrays on the playground. In science we have made moving puppets of skeletons and used scientific language when describing them. We loved our visit from Zoo Lab. We learnt all about Charles Darwin and met some wonderful creatures. In DT we have designed and made our own theatres. This was after learning about some of Andrew Lloyd Webber's musicals. We worked really well together even when it was tricky. 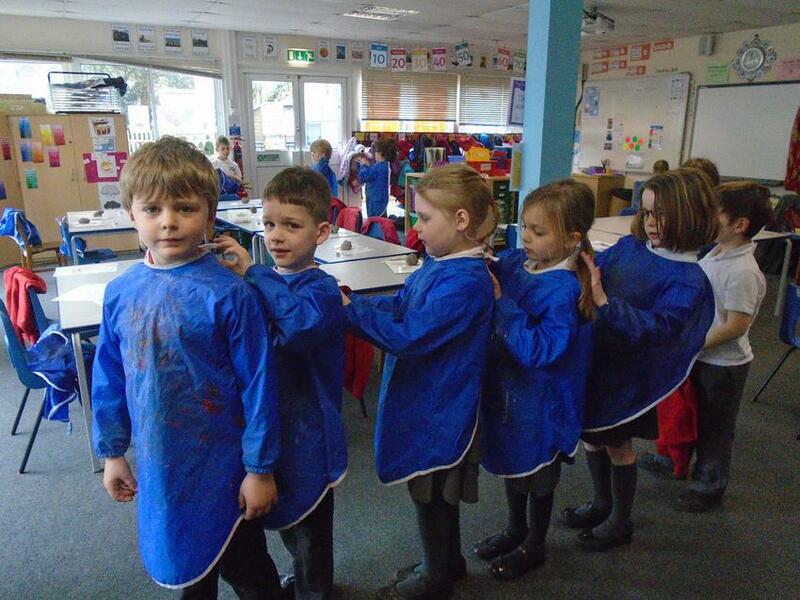 During our Forest Friday activities, Mrs McCleary challenged us to make the longest line possible using only natural materials..in just 5 minutes! We enjoyed making our own healthy lunch as part of our work in science this week. We have been worm charming during our Forest Friday activities. We tried to make the rain sounds in lots of different ways but the worms were quite elusive! Today we have been learning all about Mozart in our music lesson. 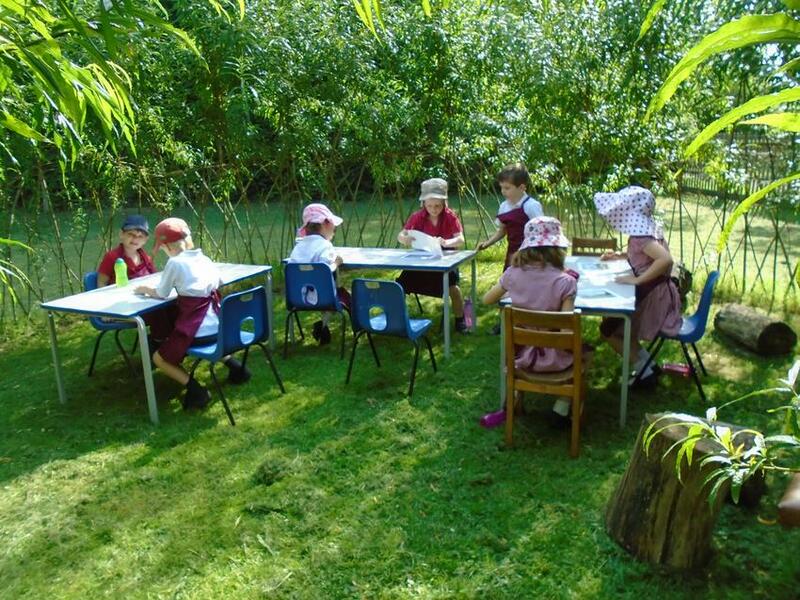 Squirrel class really enjoyed doing their art outside in the willow classroom. 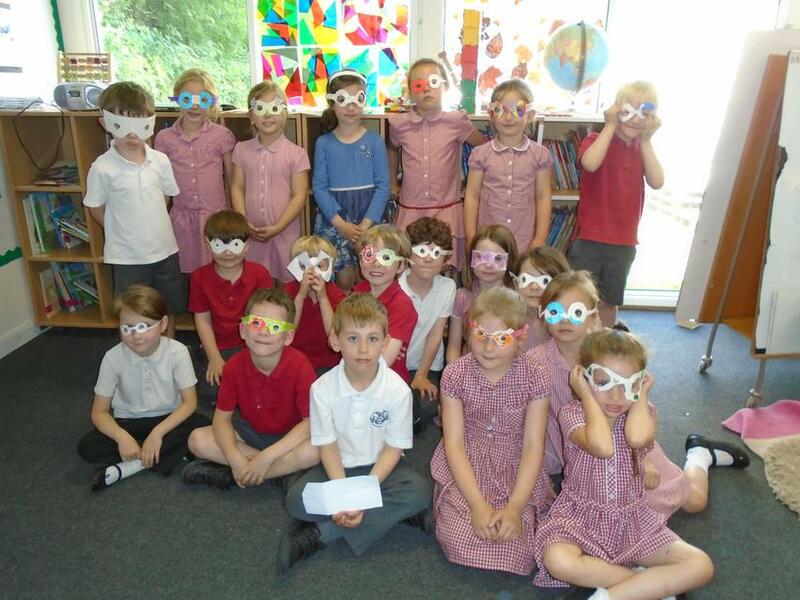 After reading Jim and the Beanstalk in literacy, we made our own glasses like Jim did for the giant. It was tricky, but fun. 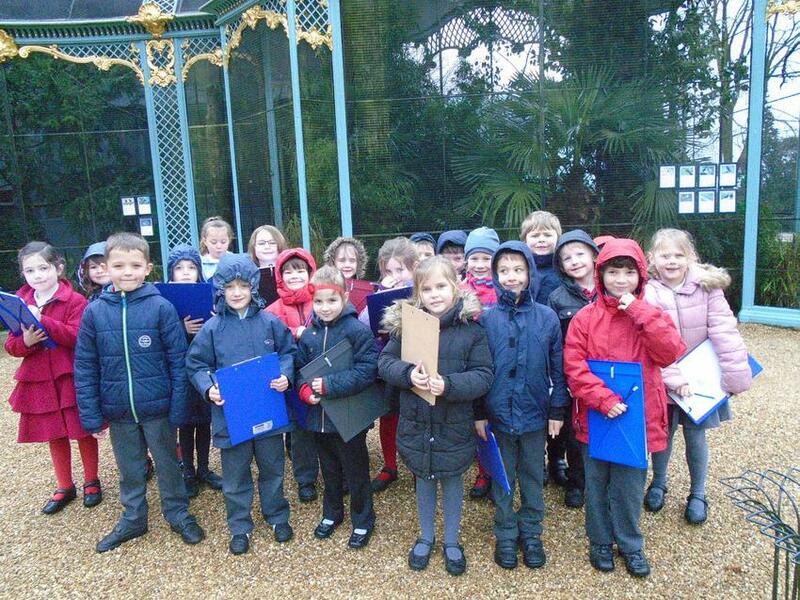 Squirrel Class recently visited Waddesdon Manor. We had a fantastic time even though the weather was not good. We saw some amazing things in the manor including a priceless elephant statue. We made some Indian mandalas in the afternoon. We have been looking at capacity work in our Maths lessons. 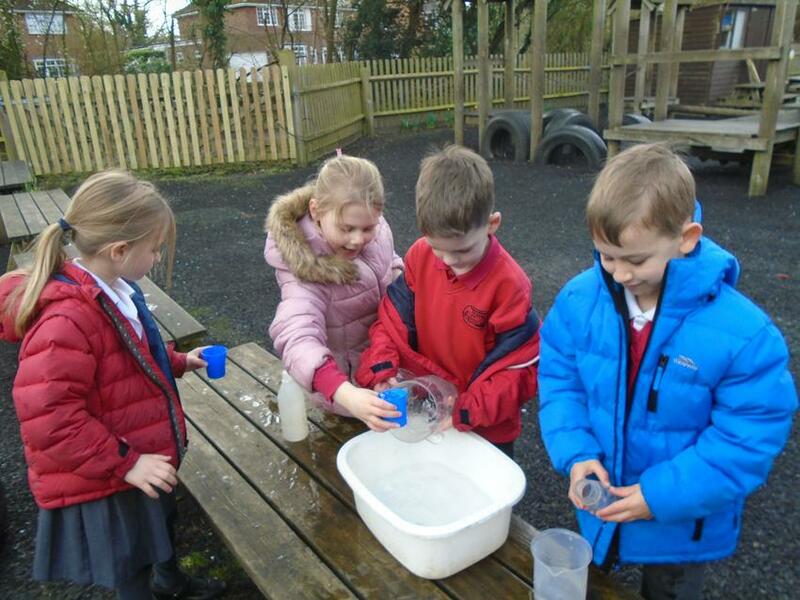 We measured water in containers and compared the capacity. We had a very windy day and had lots of fun watching the leaves fly. 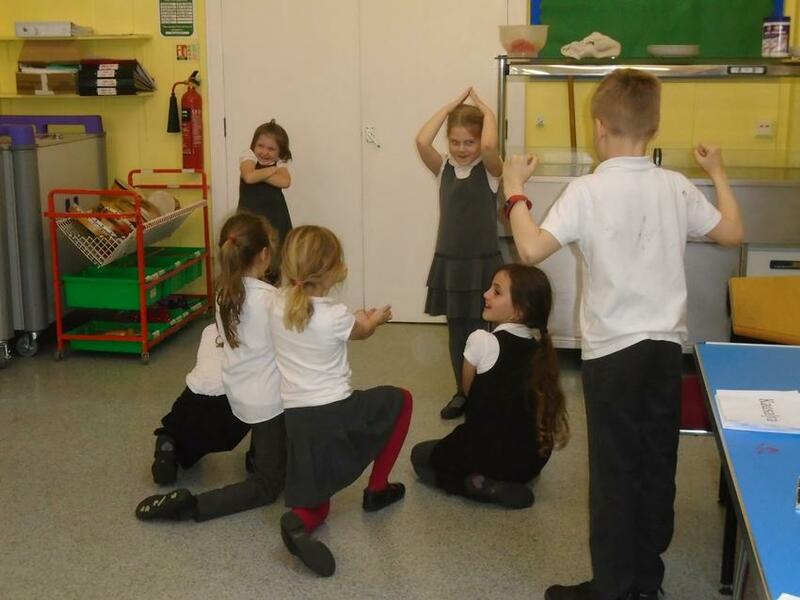 Squirrel Class and Year 3 told the story of Rama and Sita during a Diwali Drama workshop. Working together they played different roles to show the story and freeze framed different parts of it throughout the session. Working together we put our overalls on so that we could make divali light pots with clay and put patterns on them.